Description: This is a blue plastic child-size attic-style trunk that stores special dress-up accessories for fun and creative dress-up play. 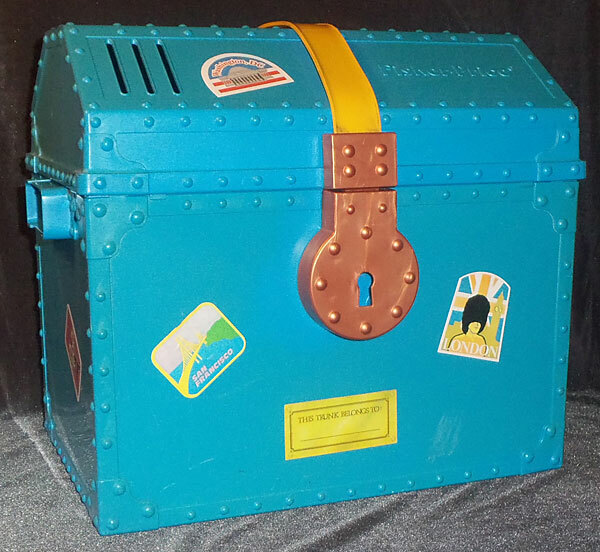 The trunk has a lid that really creaks when opened and a secret key that locks and unlocks the trunk lid. 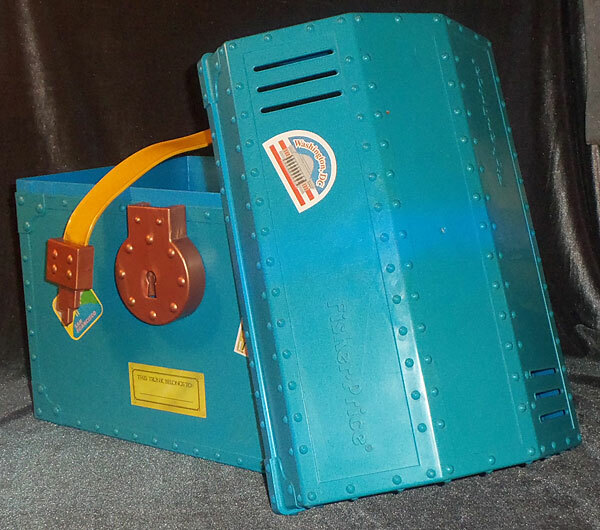 The dress-up accessories that fit inside the trunk was items such as a yellow construction helmet with 3 interchangeable badges, glasses with interchangeable facial features, and more! Designed for children ages 3 to 7 years old. FPT19239 - Rectangular mirror with a red plastic frame and hinged hook that doubles as a stand. FPT19241 - Policeman badge - has a yellow bird with its wings spread wide across the top, a yellow star in the center, and "POLICE" in blue above the star. FPT19242 - Fire Chief badge - the badge has a red background with a yellow fire chief symbol in the center. The center of the symbol is marked with a red "5" with "FIRE" above it and "CHIEF" below it. FPT19243 - Race car driver badge - oval-shaped badge with a green background, a red "1" in the center, and a black and white flag on each side. FPT19244 - Red radio mouthpiece that attaches to the side of the helmet. FPT19247 - Brown plastic moustache. FPT19248 - Black plastic moustache. FPT19249 - Left brown plastic eye brow. FPT19250 - Right brown plastic eye brow. FPT19251 - Left black eye brow. FPT19252 - Right black eye brow. FPT19253 - Red arrowhead that attaches to the side of the glasses. FPT19254 - Red arrowhead end feathers that attaches to the side of the glasses. This set was sold in a 15" long, 10-1/4" high, 16" deep.